Firefox users who have the content blocker uBlock Origin installed receive a permission prompt currently when uBlock Origin is updating. The prompt requests permission to store unlimited amounts of data. Firefox displays the prompt during the upgrade of uBlock Origin. The two options that are provided are to allow the permission by selecting "update" or to disallow it by selecting cancel. uBlock Origin has been updated. You must approve new permissions before the updated version will install. Choosing "cancel" will maintain your current add-on version. Store unlimited amount of client-side data. The update won't be installed if you select cancel. The change brings the uBlock Origin extension for Firefox in line with the Chrome extension. Chromium-based versions of uBlock Origin requested the permission since 2014 when the extension was first published. 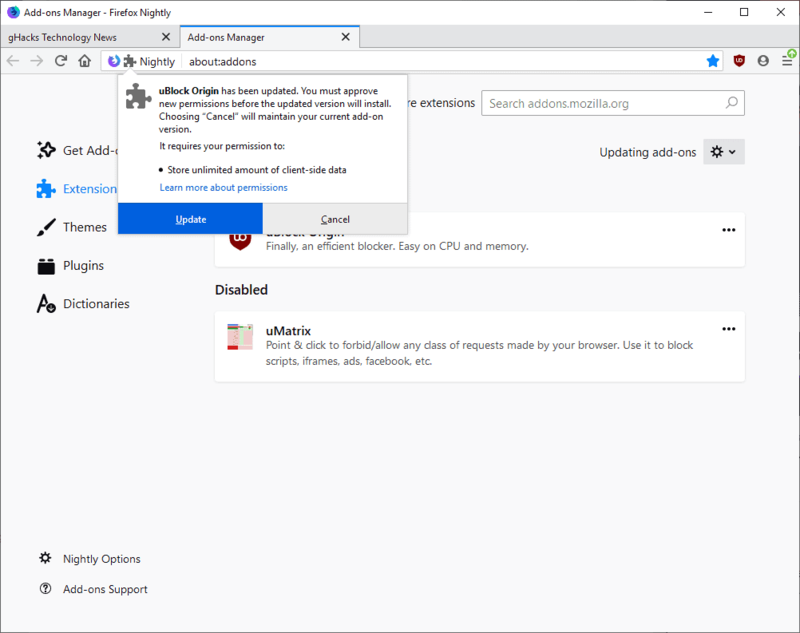 Mozilla notes that extensions should only request the unlimited storage permission of they use more than 5 Megabytes of storage; this is the case for uBlock Origin as it uses more than 5 Megabytes of local storage in its default configuration. The change has no impact on the functionality of the extension at this point. Firefox does not enforce local storage quotas which means that extensions may store more than 5 Megabytes of storage even if they don't request the permission currently. It is possible that the storage limit will be enforced eventually, however. The new permission request in uBlock Origin is a preemptive one to avoid issues in the future if the limit is enforced by Mozilla. While preemptive in nature, it is still justified as the extension uses more than 5 Megabytes of local storage in its base configuration. The permission brings uBlock Origin in line with the Chrome version of the extension. Firefox users who want to continue using up to date versions of the browser extension need to allow the new permission by selecting update. Now You: Do you use a content blocker in your browser of choice? The web of 2019 is borderline, nay, completely unusable without a content blocker. uBlock Origin is my drug of choice for this at work or on my phone, otherwise a DNS filter at home through a piHole. I stick with ABP+ v2.9.1 and the Element Hiding Helper v1.4 on Waterfox. Those two together with Decentraleyes, Privacy Badger and various other anti-tracking add-ons. I’ve switched to using Cloudflare DNS now since my VPN’s DNS servers are located in Sweden which causes problems with online shopping since everything gets priced in SEK instead of euro. @TelV But Dude, Cl0udfl4r3 is tracking you. Thank you for the information, very fast! i’ve downloaded filters lists for ublock and I realised that all of them phone home (for update) when firefox starts. It seems that most of them are hosted by Amazon services (AWS ?) Google etc. I’m confused as to what uBlock is storing in the first place. I’ve tried looking it up in various ways but nothing comes up explaining it. If all it’s supposed to do is block ads why does it need “unlimited client side data” storage space? It uses lists so it can block ads. Lists are really large. I worry this cache storage could be hacked and used to get indirectly our browsing history or preferences without for us the possibility to void this cache. This indexedDB is supposed to list the adds, which might content pieces of information crucial to understand someone’s habits and preferences. Ad-blockers are storing lists of elements they should block. Do they also phone home when you turn off auto update? Filter lists! EasyList alone is nearly 3 megabytes. I got that notification and forgotten all about it until our gracious host brought this to my attention. I just clicked “Update” without even really reading it, or even giving it a second thought! I hadn’t realised this is the way it has always worked with Chromium. It’s always good to know these things. I use uBlock Origin everywhere I can. Only places I don’t is on my Android phone (Samsung Internet Beta w/AdGuard) and Brave (Brave Shields are basically uBlock w/o cosmetic filtering). I can’t imagine browsing the web without uBlock. I am using uBlock in everywhere but i cancelled. Should i update and approve that permission? I am really confused because i don’t know what does it mean by store unlimited data. Yes you should update, the term “unlimited” makes it sound as if uBlock would suddenly use much more space on the disk but that is not the case. And one more thing what does this commits mean? Can we view all the data stored by uBlock? Does the program ever trasmit the data it stores? uBO does not have a dedicated server. You can see the filterlists and you can see when they are updated and you can prevent the update. uBo does not transmit its stored data! “uBlock Origin does not have a dedicated server, it can’t “phone home” with your browsing data”. Genious, lets have unlimited data storage, then someone can hack, abuse it and do whatever they want, just another attack vector. What would be smart is fixed storage that suits ublock and its lists and if needs more just prompt user. But who cares about any of that, lets do the opposite of logic. uBlock Origin and pretty much every adblocker had the ‘unlimited storage’ feature from day 1.
it is only when I grant it that it kills context search.